I just finished reading this today. This book is about one family’s successful experience homeschooling their two children from kindergarten through high school. The author, Alison McKee, is the children’s mother and their primary teacher. McKee was publicly schooled herself and is also a certified teacher who has worked in the public school system. She began her career as a teacher of blind students, following in the footsteps of her mother. So her perspective is that of someone familiar with both homeschooling and public school. Their homeschooling method is mostly child directed learning (also known as ‘unschooling’) so McKee’s role as her children’s teacher is actually more of a facilitator of their learning. She explains what this means to facilitate her children’s learning. She also tells of the challenges along the way to avoid the urge to control or superimpose outside values on the learning processes of her children. When she did so, it hampered their natural interest and joy in self-directed learning. Conversations with her husband helped her to understand the benefits to their children of allowing them to pursue these unconventional ways of learning. She describes in wonderful detail the success their children experienced when allowed to follow their individual interests and learn subjects at their own pace. As a homeschooling parent who attended public school herself, I can really relate to the author’s concerns about how well our homeschooled children will meet the same standards as public school students. I found her experience and advice to be very reassuring. At the end of reading this book, my enthusiasm for homeschooling is even greater. 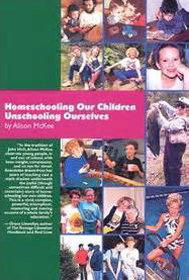 I highly recommend the book Homeschooling Our Children, Unschooling Ourselves by Alison McKee for anyone interested in the subject of homeschooling.